On the office’s wall hang two Calvin and Hobbes cartoons — a personal favourite of the world-renowned Dal battery researcher. One in particular stands out: originally published in July 1987, the comic strip finds Calvin outraged over garbage and litter, and how humans treat the planet more generally. “That’s what it’s all about, right here,” says Dr. Dahn, who says his continuing quest to build better, longer-lasting batteries has always been informed by an environmental consciousness. 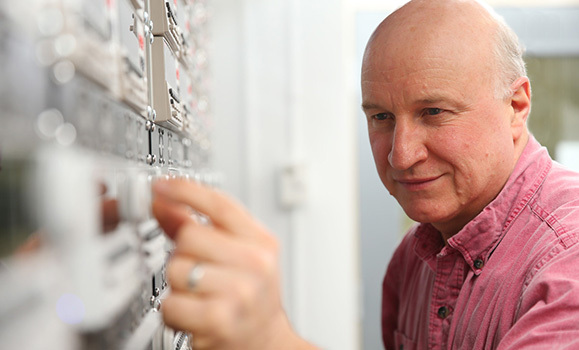 For more than 35 years, Dr. Dahn has been at the forefront of research and innovation in battery technology. Through a mixture of fundamental and applied research, the work of his team can be found in some lithium-ion rechargeable batteries used in power tools, electric vehicles and other devices around the world today. Now, collaborating with Tesla as an industrial research chair, his lab is helping improve lithium-ion cells for electric vehicles and energy storage. And on Tuesday (February 7), that body of work was recognized with the highest scientific honour in Canada. Dr. Dahn is the 2017 recipient of the Natural Sciences and Engineering Research Council’s (NSERC) Herzberg Canada Gold Medal. The esteemed prize is akin to a lifetime achievement award, celebrating sustained excellence and overall influence of research work conducted in Canada. It’s an incredible honour for Dr. Dahn, a researcher who’s made Dalhousie his home base for more than two decades. It’s also a milestone award for the university itself. With Dr. Dahn’s win, three of the past four Herzberg recipients have been Dalhousie faculty — a very rare feat in the 20-plus year history of the award. Dal microbiologist Ford Doolittle received the award in 2014, while theoretical chemist Axel Becke was awarded the 2015 medal. Dr. Dahn says he was “stunned” when he heard he would be receiving the Herzberg, which comes with a $1-million research prize. He adds the Herzberg Gold Medal award to an impressive set of awards and honours throughout his career. 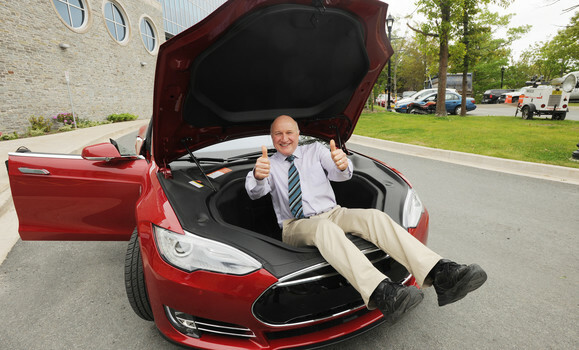 They include the inaugural Governor General’s Innovation Award (2016), the Yeager award from the International Battery Materials Association (2016), induction into Nova Scotia's Science Hall of Fame (2016), fellowship in the Royal Society of Canada (2001). He even has a second Herzberg award — a different medal, also named after Nobel-winning German-Canadian physicist Gerhard Herzberg, from the Canadian Association of Physicists. From the beginning, his research focused on the science of batteries and energy storage. In the 1980s, researchers were beginning to explore using lithium compounds as the core electrode materials in lithium batteries. Today, lithium-ion batteries — which don’t actually contain lithium metal at all — power rechargeable devices of all sorts, from cell phones and laptops to tools and electric vehicles. It was at Dalhousie, though, where Dr. Dahn and his team would make perhaps their most significant contribution to lithium-ion batteries. Post-doc Zhonghua Lu, graduate student Dean MacNeil and Dr. Dahn developed certain grades of lithium nickel-manganese-cobalt (NMC) oxide compounds, ones that when used as the positive electrode, increase the safety and stability of the batteries at larger sizes. Seventeen years later, these grades of NMCs are widely used in power tool and electric car batteries around the world — and represent several of the 65 or so inventions that his team has patented. And 3M (Dahn's industrial partner at the time) has licensed the use of these NMC grades for commercial use to many companies around the world. Dr. Dahn’s team has also made significant contributions to research on lithium-ion battery lifetimes: understanding what causes lithium-ion cells to die, and how to get them to last even longer. Graduate student Chris Burns and research associate David Stevens, who were involved in this research, created the Dartmouth-based spin-out Novonix. The company produces ultra high-precision charger devices — the sort that allow their customers to predict lifespans of Li-ion cells on the scale of not just years, but decades. 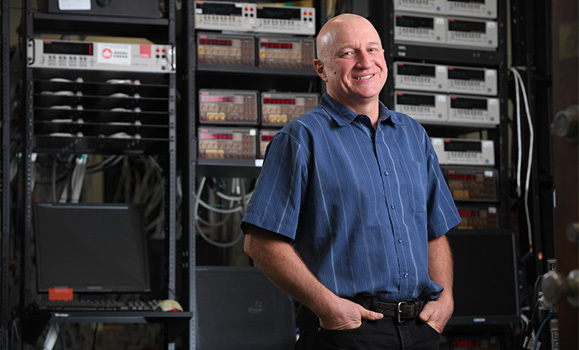 Indeed, Dr. Dahn — who, even with his two research chairs, has taught first-year Physics classes at Dal for more than 20 years — says his proudest achievements are in the careers of the graduates who’ve come out of his lab. “I’ve trained a lot of graduate students — probably over 50 PhDs, 20 to 25 postdocs. And virtually all of them have gone on to careers in the battery materials or lithium-ion battery space… Some are millionaires because they’ve formed their own companies and done really well. A lot of them are vice-presidents research or chief technical officers and so on. After helping lay the basic scientific foundation for lithium-ion batteries in the 1980s, the bulk of Dr. Dahn’s career has been in close collaboration with dedicated industry partners. It’s a path that’s allowed him to focus his research on applied solutions to the problems faced by battery manufacturers. His latest collaboration, launched in 2016, is with Tesla as the NSERC/Tesla Canada Industrial Research Chair. The company is one of the largest manufacturers of the electric vehicles in the world and its new Gigafactory, based in Nevada, is bringing roughly one-third of global lithium-ion battery production to North America. But when it came time for the company to sign its first ever university research partnership, it went north — and east — to Jeff Dahn’s door. Tesla — which aims to not only improve electric vehicles, but “accelerate the world’s transition to sustainable energy” more broadly — signed-off on a five-year exclusive collaboration with Dr. Dahn’s lab, focused on increasing the lifetime, decreasing the cost and improving the energy density of lithium-ion batteries. Some of the lab’s work could be incorporated into the company’s products shortly — perhaps within a year, Dr. Dahn speculates. As he talks about the future of renewable energy, and the vision of mass-scale energy storage, there’s an incredible enthusiasm in his voice. He sees a better future for how we power our planet — and it’s a future he and his students are helping build. We asked some of Dr. Dahn's former students and Dal colleagues to share their appreciation for his work and his contributions to both his field and to Dalhousie. "With a 35-year career in innovative thinking, fundamental understanding, impressive achievements and strong industry partnerships, Dr. Dahn exemplifies research excellence." "Jeff serves as an inspiration to all his students... He was a great mentor and supervisor, and was pivotal in helping me get to where I am today." "Jeff Dahn is both an outstanding scientist and an exceptional teacher. His strong work ethic and passion for research are contagious." "Jeff holds first-year Physics students spellbound in his lectures, encouraging them to pursue science. He mentors students in research training at both undergraduate and graduate levels, preparing them to be the next generation of outstanding scientists." "Motivated by curiosity, understanding and real-world relevance, Jeff is the embodiment of the true scientist."